Yesterday, when I came home, I said to Adam, “Do you smell kind of a poop smell?” And he said, “Yeah, it smells kind of like an animal.” I groaned and wondered where the strange smell was coming from. 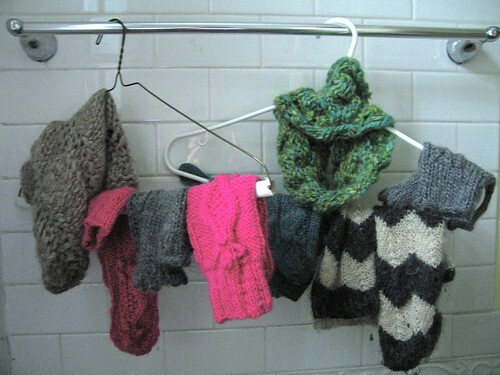 Adam investigated and then he sat down and said, “I have discovered the source…YOUR KNITTING.” It’s true–I washed all of my mittens and stuff (with an odorless wash) to put away for the summer and they were emanating a sheep-y woolen smell. It was like the spirit of the sheep had come alive. We’re wool and we smell!! Thankfully, the sheep smell goes away once the stuff is dry.